For use with standard style modular plug connectors, the Tele-Titan's straight action design powers through to all eight contacts, ensuring a uniform crimp every time. 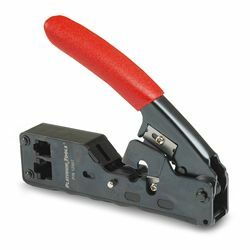 The Tele-Titan will also strip round wire and flat satin cable, making it a go-to tool for your networking needs. The compact design requires low force, making crimping as easy as a gentle squeeze. Replacement blades sold separately. Note: not compatible with AMP connectors.